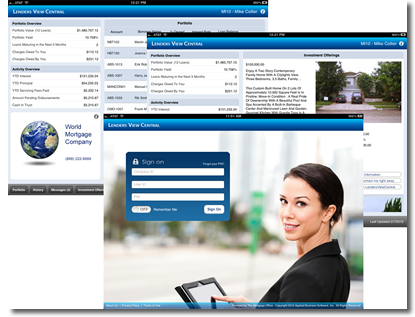 LOS ANGELES, Calif., February 17, 2012 - Applied Business Software Inc. (ABS), developer of The Mortgage Office™, the leading loan servicing software solution for the lending industry, is excited to announce the official release of a new free application for the Apple iPad. The new application takes full advantage of the form and functionality of the iPad, and is available for download in the Apple App Store. After months of development and testing, ABS received final approval from Apple. The app is included in ABS' Web Publishing Central service at no additional cost. Subscribers to the service can have their lenders download the app for free from Apple's iTunes store. "This new iPad app represents ABS' ongoing dedication to maintaining its market-leading products and services," said Jasen Portero, lead developer of the project. “ABS continues to leverage the latest technology, and this innovative new app is the next step in our effort to redefine how loan servicing applications are used by our clients,” said Carlos Nodarse, VP of Operations at Applied Business Software. "We are excited to provide Apple iPad users with a unique application that takes full advantage of what the iPad has to offer in an exciting and imaginative way," said Jerry Delgado, President, Applied Business Software. The new application is available now for download from the Apple App Store. For more information regarding The Mortgage Office™ suite of products, contact ABS at 800.833.3343 or email us at sales@absnetwork.com. Applied Business Software, founded in 1978 and creator of The Mortgage Office™, is a market leader and global provider of software systems and solutions to the lending industry. The Mortgage Office™ is a complete suite of software products designed from the ground up to specifically address the needs of those who originate and service loans. The Mortgage Office™ has consistently rated superior in design, system interface, expandability, and ease of use. The Mortgage Office™ collaborates fully with the Microsoft Office suite of products and is designed to make loan servicing more profitable and your overall business run more efficiently. ABS is based in Long Beach, California. For additional information about ABS’s products and services, visit www.themortgageoffice.com or call (800) 833-3343. For Applied Business Software, Inc.